Bright, vibrant, and ready to inspire with each sun-kissed bloom, this simply stunning flower bouquet is a gift your recipient will always remember. Rich red roses, orange roses, orange spray roses, orange gerbera daisies, orange Asiatic Lilies, flame mini calla lilies, red hypericum berries, and an assortment of lush greens are perfectly arranged in a oval stained woodchip basket to give this flower bouquet a natural, rustic appeal that makes it easily fit into any home or office decor. 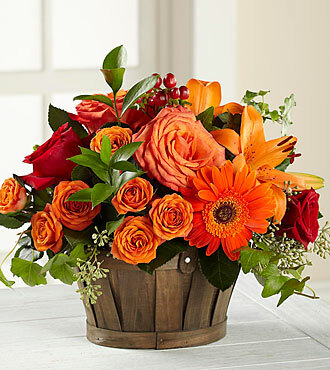 Ready to add a touch of sunshine and color to their dining table, side table, or counter space, this flower arrangement is set to create a gorgeous and unforgettable birthday, thank you, or thinking of you gift! GOOD bouquet includes 9 stems. Approx. 12"H x 14"W. BETTER bouquet includes 14 stems. Approx. 13"H x 16"W. BEST bouquet includes 18 stems. Approx. 14"H x 18"W. EXQUISITE bouquet includes 23 stems. Approx. 14"H 20"W.